Mr. Ronald Bulkan. is the fifth of seven children of Rehannah Bulkan and the late George Bulkan, both of whom were school teachers. Ronald, who was born in Supenaam on the Essequibo Coast, is a product of rural Guyana, though not exclusively so. He attended St. Philips Nursery, Bush Lot Primary, Yakusari Govt., Massiah Govt., Dolphin Govt. and Queen’s College. He has spent his entire life in Guyana, except for a nine-month period in 1979/80, when he lived in the USA while attending the University of Houston. Mr.Bulkan is a co–founder (1983) of Precision Woodworking Limited, a pioneering company in value added processing in the wood–sector in Guyana. Mr. Bulkan and Precision were awarded the coveted Ernst and Young Caribbean Entrepreneur of the Year title in 2001, to date, the only Guyanese company to earn this accolade. He subsequently was inducted to the World Entrepreneur of the Year Academy in Monte Carlo in June 2002. Although a businessman, Mr. Bulkan is no stranger to social and political activism. He belonged to the Guyana Human Rights Association (and was a member of the Elections Monitoring Committee in the pre-1992 period). An extension of this saw his being a part of the GUARD movement and he spoke on the platform, both in Georgetown and on the Corentyne. He proudly recalls organizing a picketing exercise (together with Ian Lye) in 1992 against S.S Ramphal outside the Hotel Tower, when Ramphal was here spearheading hearings of the West Indian Commission. The exercise was meant to highlight the call for regional and international pressure to restore democratic elections and it was joined by the PPP, whose members that day included the late Dr. Jagan & Mr. Harripersaud Nokta. He was a candidate at the 1997 General Elections for the WPA. The only organizations to which he has ever belonged to are the Queens College Cadet Corps, GHRA, WPA & now a proud member of the PNC. He counts among his heroes Nehru, Gandhi, Norman Manley, Martin Luther King, Mandela, EusiKwayana, Desmond Hoyte and Muhammed Ali. Valerie Sharpe Adams-Patterson was born on August 16, 1961 in the small community of One Mile Wismar, Linden to Berthyle and Emily Adams. The fourth child of eight children, Minister Patterson grew up in an environment where both parents served as leaders in the lodge, community and church organisations. It is with this example of and passion for community involvement that Patterson later became an ordained Pastor and Apostle of the Flourishing Place Ministry and served as President of the Sectional Women’s Ministry of the Assembly of God in Guyana. A Lindener at heart and by birth, Patterson lives at Baruda Oval, Retrieve, Mackenzie and is mother to two grown boys and four grandchildren. Her earlier years saw her attending the Wismar Hill Primary School, the Christianburg Wismar Multilateral School and IDCE where she obtained a certificate in Supervisory Management. 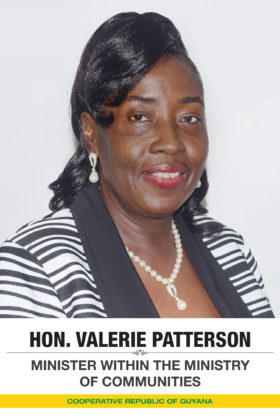 Patterson later attended the University of Guyana where she read for a Diploma in Banking and Finance and the University of American Peace Studies where she gained a Diploma in Strategic Management. Minister Patterson has been a member of the PNCR for over 20 years and most recently served as Chief Executive Officer (CEO) Linden Enterprise Network (LEN) from 2010-2015. Her desire is to see Guyana develop as a country where all Guyanese would want to return home, be comfortable and once again feel proud to be Guyanese.